Pricing for Gastric Sleeve Surgery Starts at $3,899 USD – with Medical Travel Coverage. If you’re looking for an affordable, all-inclusive surgical package, contact our helpful staff today to learn more. We provide the very best care with leading gastric sleeve surgeons and top-tier hospital facilities. In comparison with other procedures including the gastric bypass, duodenal switch, and gastric banding, the gastric sleeve procedure is more affordable than the rest. It’s also, similar price point to the gastric banding system. How Much Does Gastric Sleeve Cost with Insurance? The average gastric sleeve cost is $4,100 if you have insurance. This is the cost that is usually in the form of deductible that one can expect to pay. The average cost of the gastric sleeve without insurance: $16,000 to $20,000. This is a general range of the average price you can expect in the United States and Canada. However, it’s hard to say that there is just one typical price for this type of bariatric surgery, given how much variation there is. Depending on many factors, your gastric sleeve without insurance cost could be anywhere from $9,000 over $30,000. Airfare that needs to be arranged or obtained. 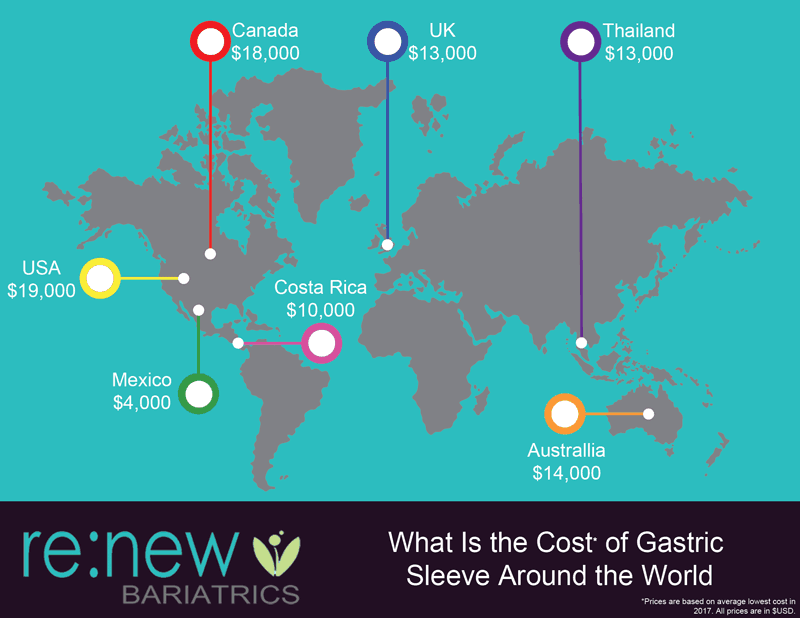 Gastric Sleeve Surgery Cost in the USA? 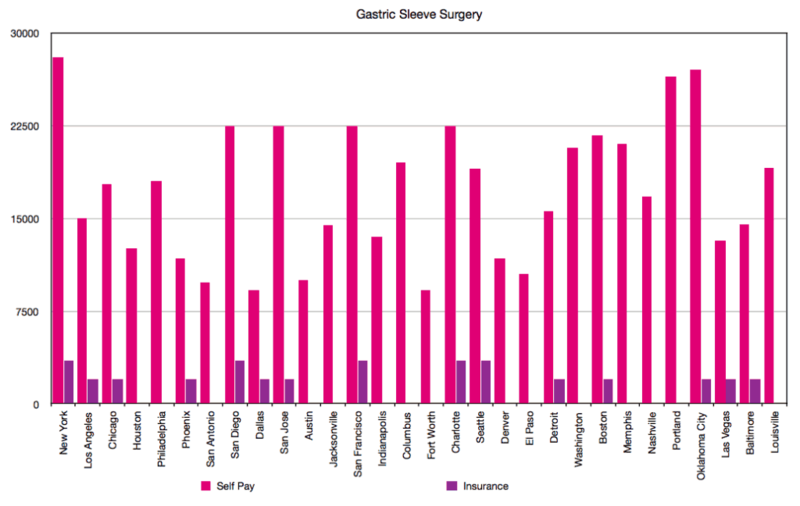 A majority of the variance in gastric sleeve surgery prices is due to where in the world the operation is performed. Within the U.S., the Southern states offer gastric sleeve surgery much cheaper than Northern states. The average cost of gastric sleeve surgery in Massachusetts, for example, is over $31,000, while in Oklahoma the average price is just $10,700. Overall, if you’re self-paying in the United States, you can expect to pay considerably more than undergoing the procedure in Mexico. Consider the fact, if you’re going with a low-cost option in the US, you’ll have to arrange our transportation and logistics, not to mention, you’ll have to fund your airfare costs to your destination. You’ll also be expected to pay and arrange for your hotel stay, some things as long a week. You can see, that these low-cost providers can end up being just as expensive as other locations in the United States. You can travel within the U.S. to get a lower price for your surgery. However, you can save even more money by traveling just a bit further. In Mexico, gastric sleeve surgeries cost only a fraction of what they do in the United States. You might only spend $4,500 to $6,000 on your surgery this way. Our gastric sleeve packages are consistently below this and have incredible outcomes. Contact our patient coordinators today, to discuss your options with the gastric sleeve. Is a Gastric Sleeve Investment Worthwhile? The majority of people who get bariatric surgery suffer from obesity-related illnesses such as type 2 diabetes, sleep apnea, high blood pressure, heart disease, and many others. Such diseases are costly to manage, between doctor’s visits and prescription medications. The weight loss caused by gastric sleeve surgery will relieve these conditions. Bariatric Surgery will typically pay for itself in 2 to 4 years, according to a report by the Wall Street Journal. This was nearly ten years ago, assuming the procedure was significantly more expensive than it is today. Furthermore, if you opt for our bariatric services, you can expect gastric sleeve surgery to pay for itself in less than two years. After some time, you will start saving money that you would otherwise be spent treating these diseases. Some estimates say that one to two years after bariatric surgery, the average patient starts saving around $900 a month in health costs. From a financial perspective, gastric sleeve surgery is an excellent investment. Interested in undergoing Gastric Sleeve in Mexico? Please contact our helpful, knowledgeable patient educators who can help guide you through the entire process of getting approved for the gastric sleeve surgery in Tijuana, or Cancun. Gastric sleeve surgery involves removing a large portion of the stomach, and it’s an effective way to treat severe obesity. The procedure is irreversible, but because of this, it produces long-lasting results, making it great value for the cost. By applying for surgery today, you can quickly determine your candidacy – often within 24 hours.